Stir Raw recipe – a simple classic! This recipe is by my dear friend and raw food mentor, Master Chef Chad Sarno. Such a simple way to make a delicious warm raw meal!!! If you don’t own a square dehydrator like the Excalibur or Sedona, just put the dish in your oven at about 50°-75°C with the door ajar. Stir it frequently and after 30min it should be ready to be served. Test the food temperature with your little finger! 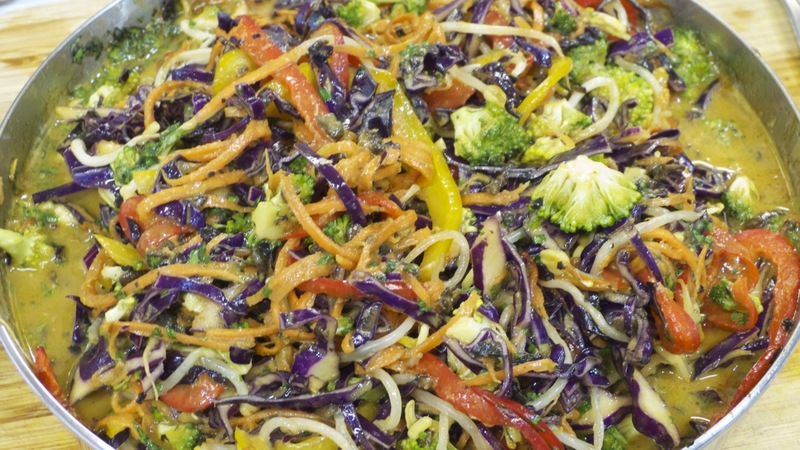 We made this dish at last week’s ‘Warm Winter Raw Foods – Asian’ class. Very enthusiastically received! Make more of the sauce and keep it in the fridge as an addition to your salads, sprouts or boiled potatoes/kumara! You can add some lemon grass and kaffir lime leaf if you feel adventurous. In large bowl toss the broccoli, bell pepper, cabbage, carrot, marinated portabella mushrooms, Asian bean sprouts, cilantro and basil. Set aside. In high speed blender, continue to blend the olive oil, orange juice, miso, ginger, garlic, tamari, sea salt and cayenne. Toss the sauce with the mixture of vegetables. Allow to marinate for about an hour. Spread on dehydrator sheets and continue to dehydrate at 105°F for 2-3hours. Serve warm.